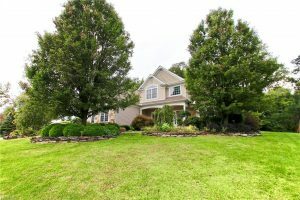 10993 Stonewycke Dr, Concord Beautiful custom built home with 5 bedrooms 3 full bath 1 1/2 bath. Master with whirlpool tub and other full bath with custom steam shower. Newer carpet throughout home and freshly painted. Extra loft space was finished with closet for extra space as in law, teen or movie suite. Basement has a fully plumbed kitchen ready for your finishing touches. Workout area, family area and dining area.